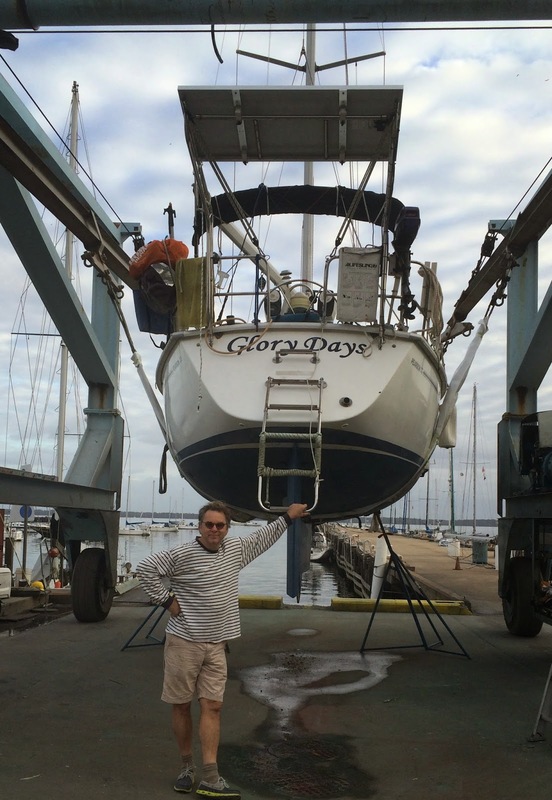 Coming back to get Glory Days out of summer storage seems like a rebirth. 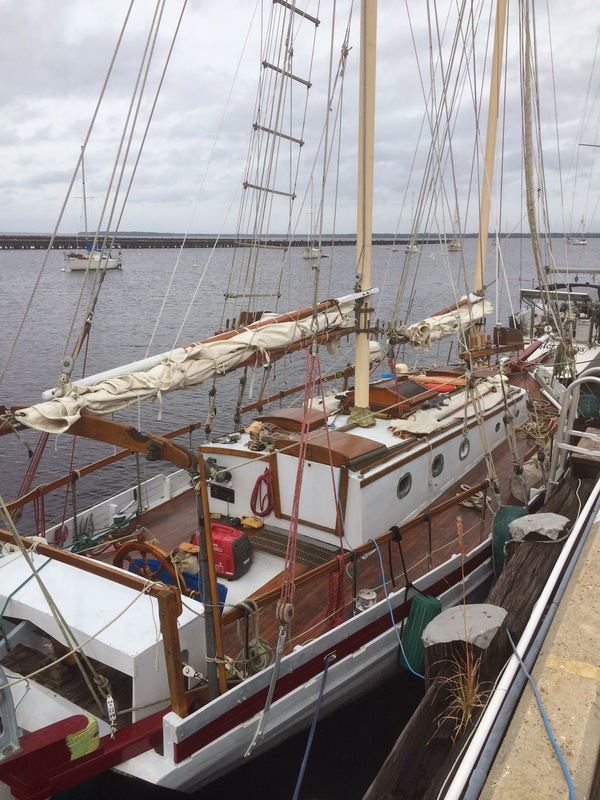 But the time has now come to uncover her, dust off her sails, scrub her bottom and tease her into another round of sailing and exploring… Trust me, it won't take much to convince her. There must've been at least 150 boats all high and dry like this with worker bees like me swarming all around doing this and doing that at a pace that bordered on possessed. Yep, she looked a bit forlorn when I left her high an dry on Aug. 1, to drive back to Atlanta. But she's good now, and she was jumping like a puppy upon my return in November to get her back in shape… well sort of… you get the idea… maybe it was ME who was jumping like a puppy. …. the first order of business would be to clean her up and install the newly finishing teak flooring panels that I had completed at home. 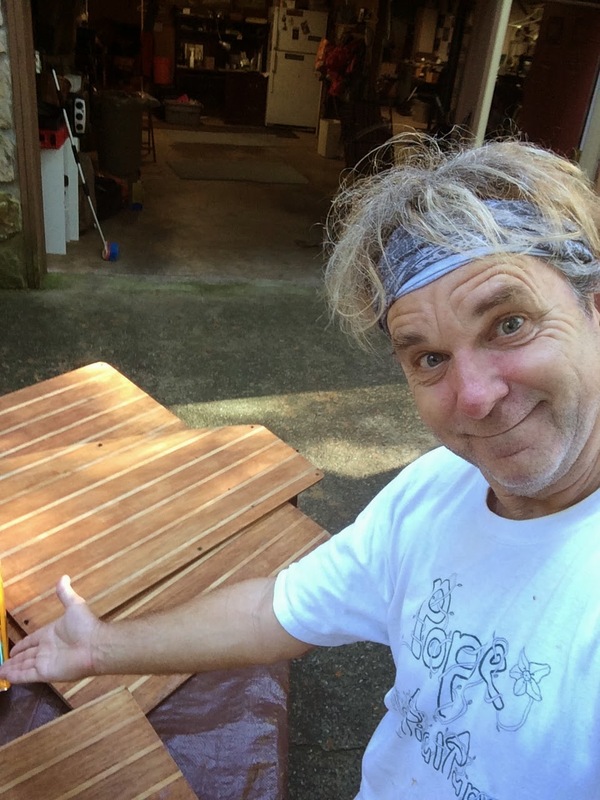 These floor panels below were striped, sanded and varnished…. 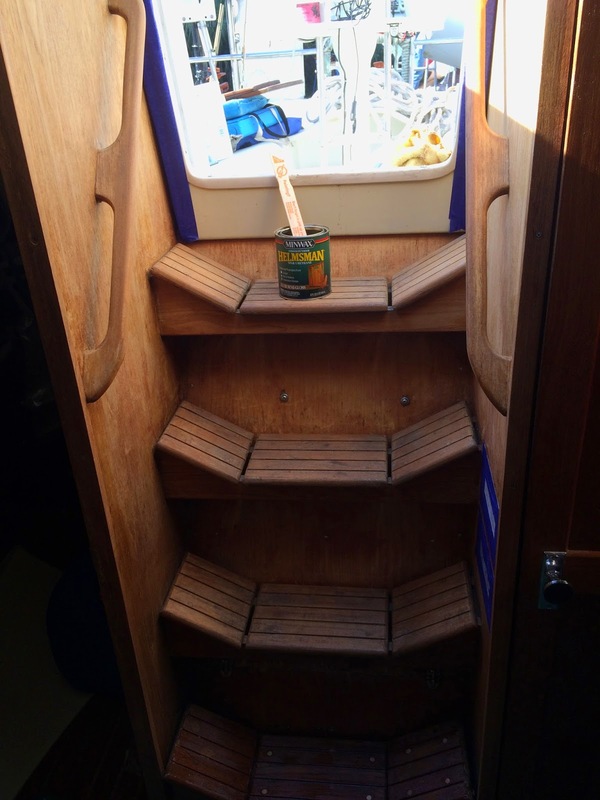 Everything went in smoothly as the cabin sole shined once again… It looked so good I decided I might as well strip, sand, and refinish the main companionway steps… ahhh…. she's grinning, just knowing her bottom will be next… See before and after photos below. Next on the agenda was to do a complete bottom job of sanding and painting. 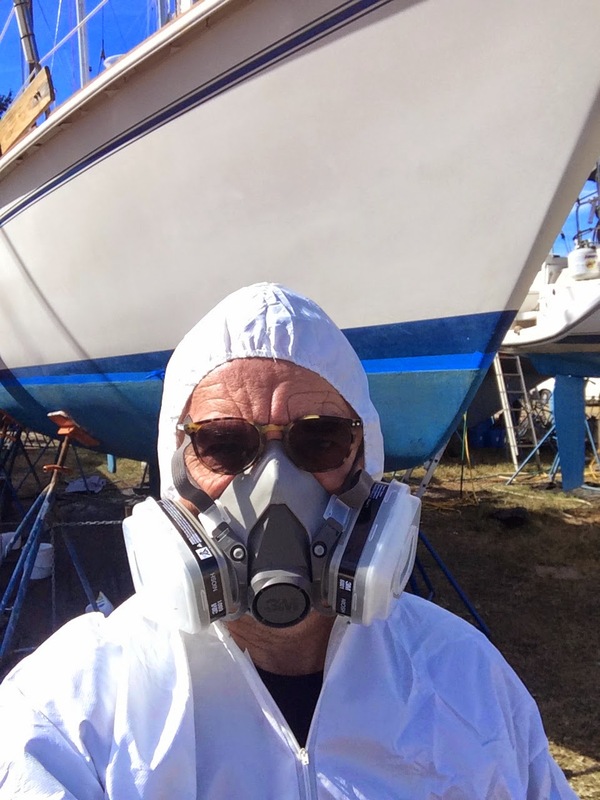 This was my first go at doing a bottom job, and I was committed to cutting no corners in the process… the first thing was a good cleaning, then a good scrubbing, then the dreaded sanding of the hull surface… ug, the dust of it all pervades….All this took about 3 days…. 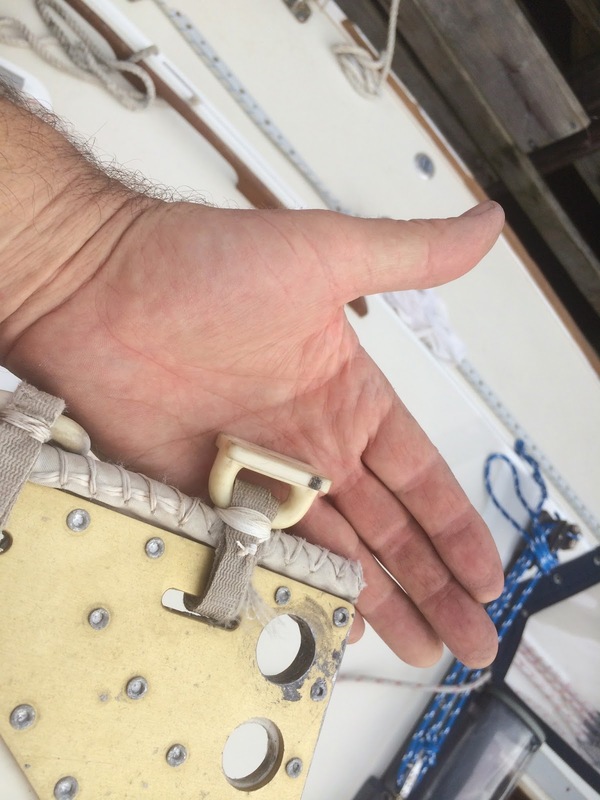 I must say the boat yard at Green Cove Springs marina is really tailor made for do-it-yourselfers like myself … Here, they allow you live on your boat while she is on the cradle as you work to get her ready for splashdown…. In essence I suppose this boat yard is somewhat of a toxic waste dump from years and years of sailors like me working with fiberglass challenges and toxic chemicals perpetually … and because of this known fact, I decided I would invest in a real respirator to avoid breathing in so much dust and vapor from the paint and cleaning products… Below, I added a coat of red for undercoating. I call this Organized Chaos. An undercoat of red should work fine. That will make it easier to tell when the blue outer coat is starting to wear thin. 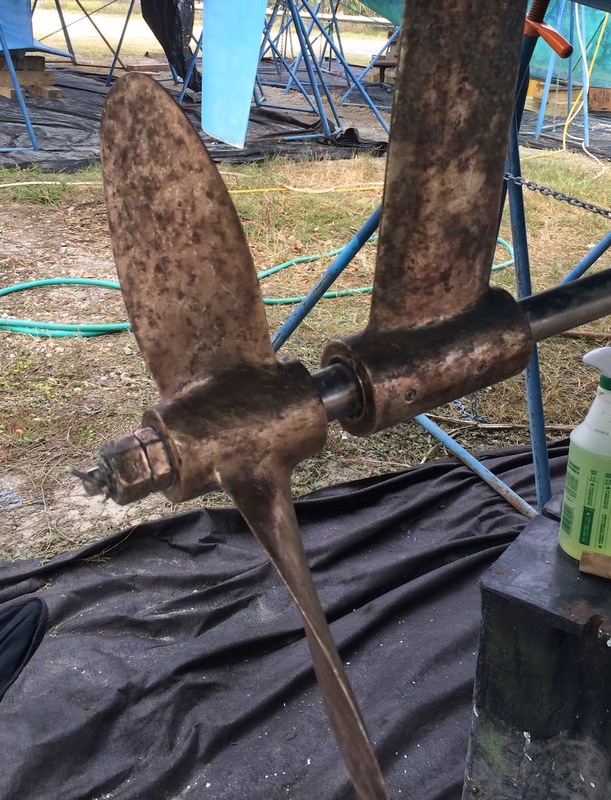 Antifouling paint cost $250 a gallon, so you want to do it right and waste not a drop… keep it stirred! Here's a few scenes and captions from this unique experience…. Typical views from the boat yard at Green Cove Springs.. It's like insurance, but better. 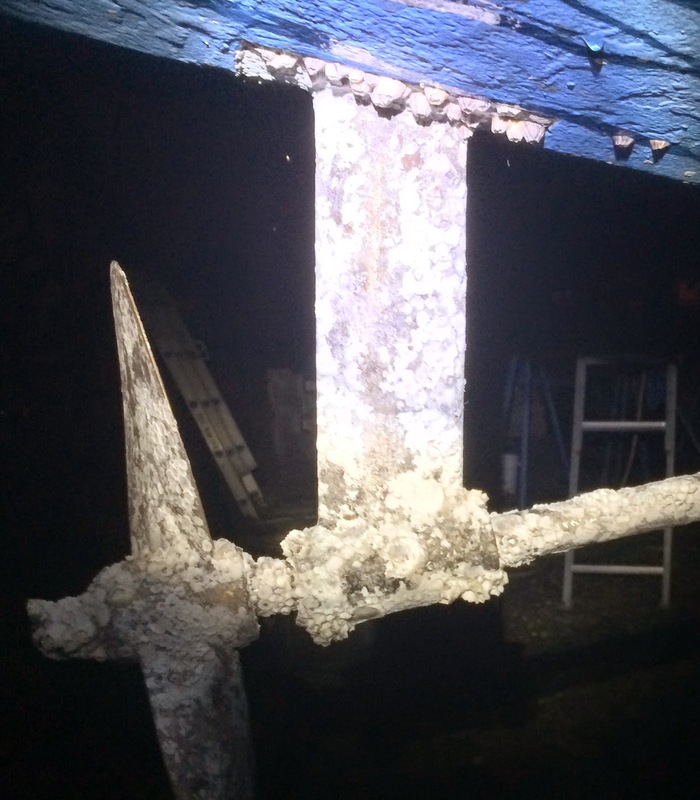 I met this friendly French Canadian, Michel, while here and we worked really hard on our boats as you can see. 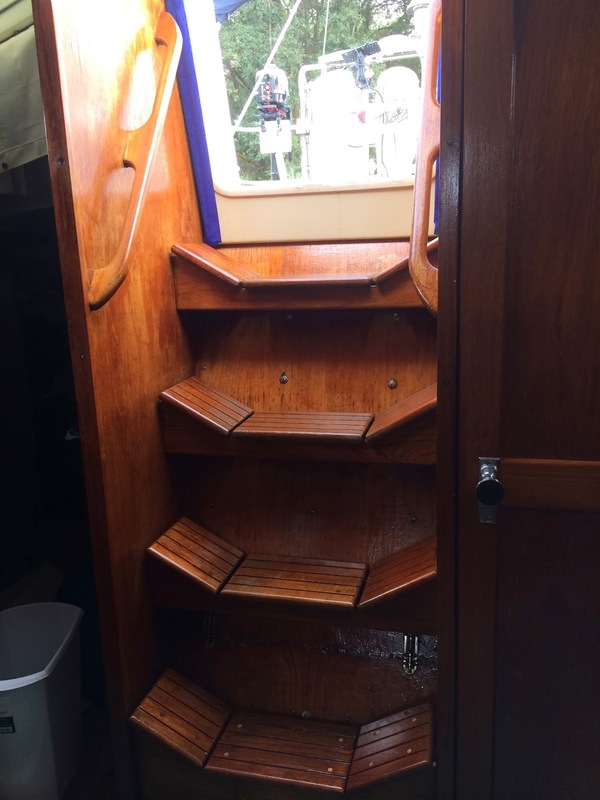 This is a classic yacht, Mountain Time, hand built by my neighbor here… he was such a sailing purist that my little chunk of fiberglass paled in comparison…. its all good tho. 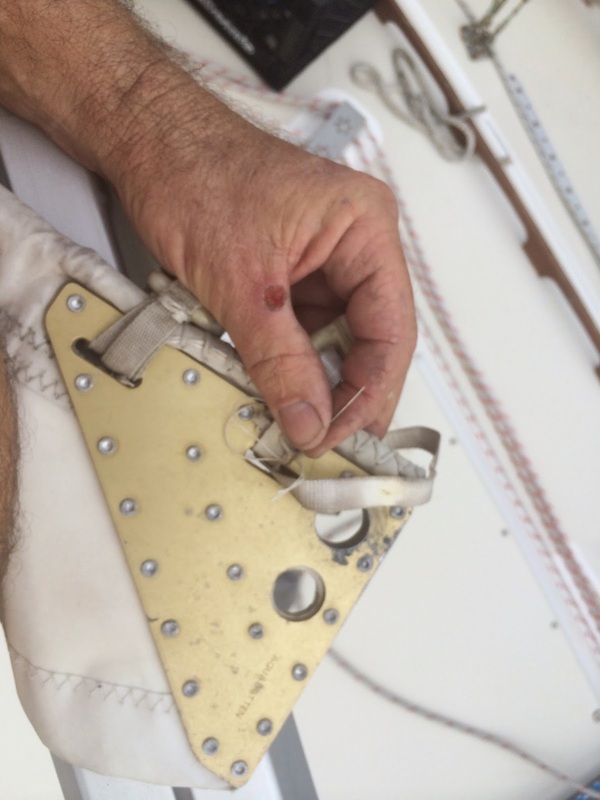 I had a little sail repair to do before I could put the sails back on. 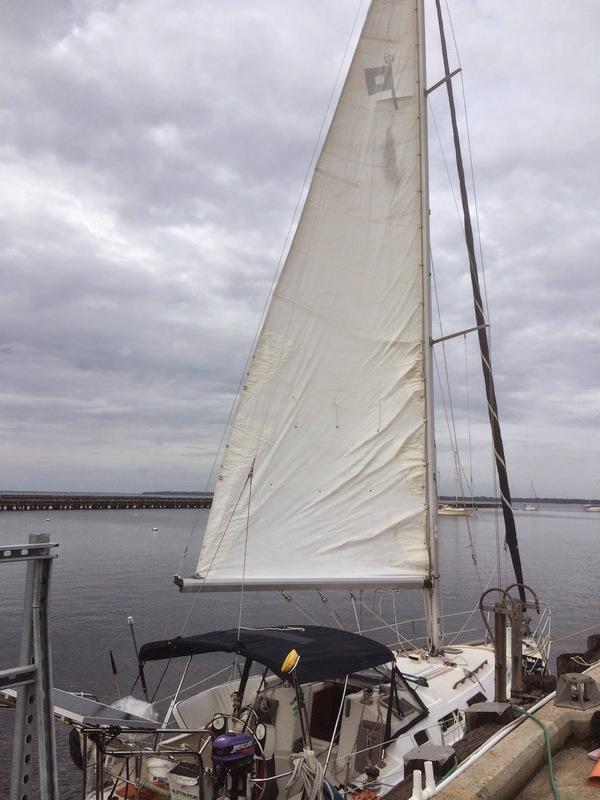 I had removed both sails during hurricane season just in case a big wind came through. Suddenly, I'm now a seamstress in addition to a carpenter, mechanic, electrician, plumber, navigator, and troubadour. At last! Back in the water! The next episode will be an update from Jacksonville, Fla as I make final preps to depart south. I am choosing to leave the boat in Ortega Landing Marina for the month of December as I commute back home for the holidays. Friends, this marina is one of the nicest I've ever stayed and I would recommend it to any fellow cruiser… first class facilities. It's clean as a whistle, close to lots of shopping amenities (including Sailors Exchange and West Marine! ), friendly staff, pool, jacuzzi, clubhouse and even a dock box… This marina is fancier than what I am used to, but priced fairly since it is more inland…. I'll be back here for sure. Until then, see you soon! Stay tuned! New post coming!